April 5 is National Deep Dish Pizza Day. Although some months have passed, you don't need an excuse to indulge in one of Chicago’s favorite foods. But who came up with the idea, anyway? Unfortunately, there is no official documentation about the original inventor of the delicacy, so the origin story is largely speculation. What we do know for sure is that the Chicago chain Pizzeria Uno plays an integral part in the story. According to the Chicago Tribune, following a paper trail about the pie's creation leads you back to a 19th century mansion on 29 E. Ohio St. The mansion is now home to Pizzeria Uno. Business partners and mansion residents Ike Sewell and Ric Riccardo wanted to open a restaurant. Their first idea was a Mexican establishment, but the trial runs left Riccardo physically ill. Riccardo was Italian, so the duo decided to make pizza their plan B. Originally called The Pizzeria, their restaurant opened in 1943 and wanted to serve an Americanized version of pizza that was unique to Chicago. The result was a thick, cake-like pizza pie with gooey cheese and sausage in its center, and sauce on top. 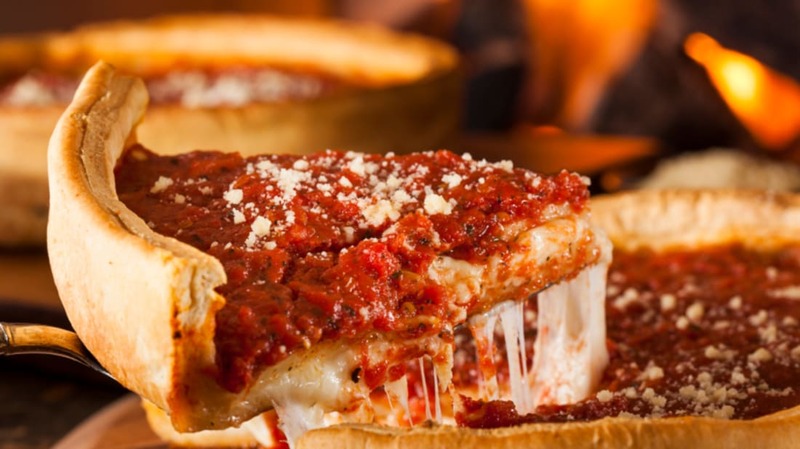 Of course, Chicagoans had been eating pizza before the birth of deep dish. The first American pizzeria opened in Manhattan in 1905, and enjoyed a boom in popularity shortly after World War II. The food was not uncommon in Chicago during the '40s, but pie from The Pizzeria (which changed its name to Pizzeria Uno in 1955) stood out due to its unique construction, and sheer weight. Sewell and Riccardo may be the founders of the restaurant that popularized deep dish, but they probably didn't create the new style of pizza themselves. Neither of them had any cooking experience, so it’s unlikely they were able to concoct an entirely new recipe. So who’s the mystery chef behind the Chicago favorite? One strong possibility is Adolpho "Rudy" Malnati, Sr. The Italian-born employee worked as a bartender for Pizzeria Uno. His son, Rudy Malnati Jr. has a 1956 news clipping that refers to his father as the one who established Pizzeria Uno. In 1991, the younger Malnati opened his own pizzeria—the famous Pizano’s. Other Pizzeria Uno employees are also suspected of having created the new style; many moved on to make deep dish pizza at other locations. Alice May Redmond, a former cook for Uno’s, eventually went to bake pies at Gino’s East. Unfortunately, the world may never know what individual created the Chicago treat. "It's an enigma, wrapped in a pie crust. Every day, it feels a little more lost to history," Jeff Ruby, co-author of Everybody Loves Pizza told the Chicago Tribune.